SEATTLE: Man Steals And Crashes Empty Airliner - Joe.My.God. An airline worker stole an empty Alaska Airlines plane from Seattle-Tacoma International Airport in Washington on Friday night, and the National Guard scrambled two fighter jets to chase the aircraft, which crashed on a sparsely populated island in Puget Sound, officials said. 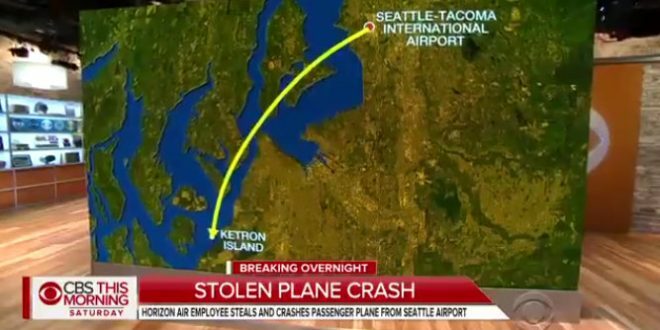 No passengers were aboard the 76-seat Horizon Air Q400 turboprop plane, which was stolen by a 29-year-old Horizon Air ground service agent from Pierce County, according to airline and law enforcement officials. Horizon Air is a subsidiary company that operates Alaska Airlines aircraft. “A joyride gone terribly wrong,” Pierce County Sheriff Paul Pastor said during a news conference in Steilacoom, which is about 3 miles from the island. No injuries were reported on the ground, Pastor said, as the plane crashed and started an intense fire on the wooded, 230-acre island, which has a population of 20. He said it appeared the man who took the plane died.